Most commonly used for Corn Dogs, our fryers do a great job on fish, chicken or anything that needs frying. By request, we can substitute a basket for the corn dog clips that come with the fryer. The fryer will turn out 12 corndogs at a time and measures 10" Wide, 22" front to back and 15" tall. ELECTRICAL REQUIREMENTS--This unit requires 1800 Watts, 15 Amps/110 Volt service. Extension cords are not recommended. 1. Fill fryer with Peanut Oil to the oil fill line in the tank, warm to 350 degrees. 2. 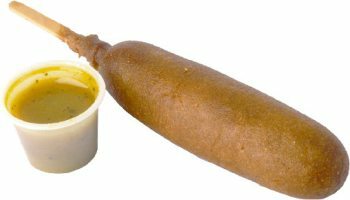 In a large mixing bowl or bucket, add water to the corn dog mix and mix to the consistency of thick pancake batter. 3. Skewer a hot dog that is thawed and dried. If your dogs are wet or frozen, the moisture from the dog will mix with the batter and cause it to slide off the dog. 4. Dip the dried dog in the batter, gently spin off excess batter and insert it in the skewer clip in the fryer, repeat till all 12 clips are filled. When the batter is golden brown, remove the corn dog from the fryer and allow to drain/dry under a heat lamp. Remember the hot dog is already cooked, we're just frying the batter and warming the dog. WARNING!!!! - Fryers are potentially DANGEROUS, they should NOT be left unaccompanied. Children should be kept away from fryers when operational. 1. Allow frying oil to COOL before draining the fryer. 2. Wipe off the fryer with a clean towel and wash all utensils in hot water prior to returning the fryer. No Heat - Your fryer is equipped with a safety micro switch that prevents operation unless properly seated in the fryer. Verify that the fryer head is properly seated on the fryer tank so the safety switch will be depressed. Low Heat - Typically an incoming electrical problem especially if running on a generator or off of an extension cord, check your power source or plug directly into a branch circuit.